I received a license. How do I apply it? Can we use applications with Splunk versions below 6.5? How much data your application generates? We use metrics from the blkio-controller. It is not always enabled. As a the workaround, you can use the sum from proc metrics, which we also collect for processes. Collector reads license key from the configuration file. If you are using collector for OpenShift or Kubernetes, you can set the license in the ConfigMap that we include in our configuration yaml files. Find the line license =, add your license key as a value. License key should not have any spaces. Starting from version 5.0 you do not need to restart the collectors after setting the license. It will pick it up automatically after few moments. If you are using collector version below 5.0 you need to restart collectors. When you modify just a ConfigMap, it does not trigger the restart of the Pod. You can just delete all the running pods in our namespace, and scheduler will create new pods. If you are using version 3 of our solution for Monitoring OpenShift and Kubernetes we deploy our collector in the default namespace. In that case you will need to manually delete all pods and they will be rescheduled with the DaemonSet. For the collector docker you can modify the collector.yaml configuration file if you already have your own. Or you can set the license key with the environment variable --env "COLLECTOR__LICENSE=general__license=...". In the application version 5.3 and above you can find a Splunk Usage dashboard under Setup. 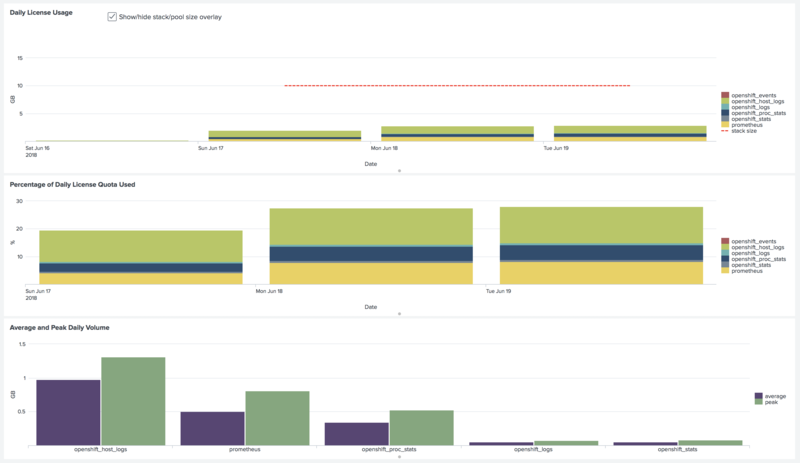 Because we are using Indexed field extractions in HTTP Event Collector, in our tests, we saw less than 5% of Splunk Licensing cost increase for logs. You can also run a search in Splunk to get the information on how much licensing usage for every source type. In our tests for Kubernetes nodes with 20-30 containers, we have seen around 200Mb a day of data indexed for kubernetes_stats and kubernetes_proc_stats together.